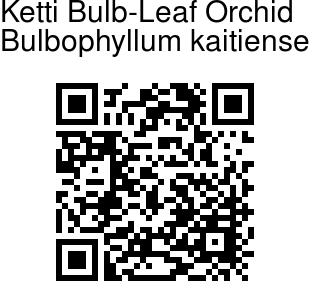 Ketti Bulb-Leaf Orchid is an orchid growing on trees or rocks, pseudobulb ovoid, 2.5 x 2 cm, distantly placed. It is named for a town called Ketti in the Nilgiri hills. Leaves are solitary, 5-7 x 1.5- 2 cm, oblong, narrowed at base, blunt at tip; leaf-stalk 2 cm long. Flowering stem is very slender, elogated, up to 10 cm long. Flowers are 4-7, yellow; bracts 7 x 2 mm, ovate, tapering, 5-veined. Dorsal sepal is 3 x 6 mm, broadly ovate, pointed, 7-veined, hooded; lateral sepals 2.2 cm x 7 mm, ovate-inverted-lanceshaped, pointed, finely velvet-hairy towards base. Petals are 5 x 3.2 mm, ovate, apiculate, slightly oblique, with reddish-brown streaks at base. Lip is 2 mm, ovate-oblong, blunt, curved. 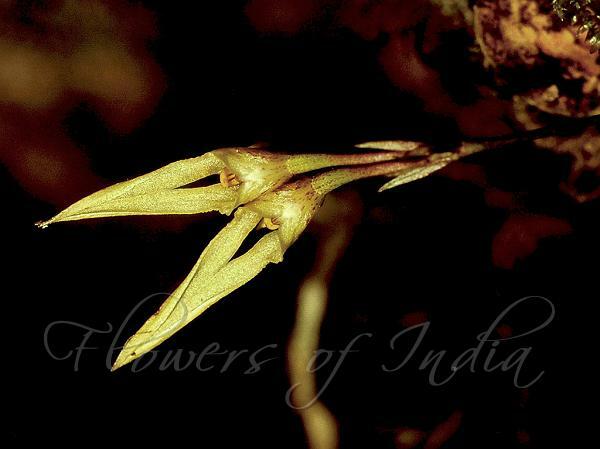 Ketti Bulb-Leaf Orchid is endemic to Southern Western Ghats. Flowering: August-September. Identification credit: S. Jeevith, P.S. Sivaprasad Photographed in the Nilgiris, Tamil Nadu.